…your Mountain Goat, that is! The Mountain Goat is a locally owned and run outfitter located just five minutes from the Appalachian Trail in Manchester, Vermont. Barleywine Graphics and Trillium Digital partnered up to help this venerable retailer come up with a gorgeous new ecommerce site that the staff of the store is able to manage themselves. 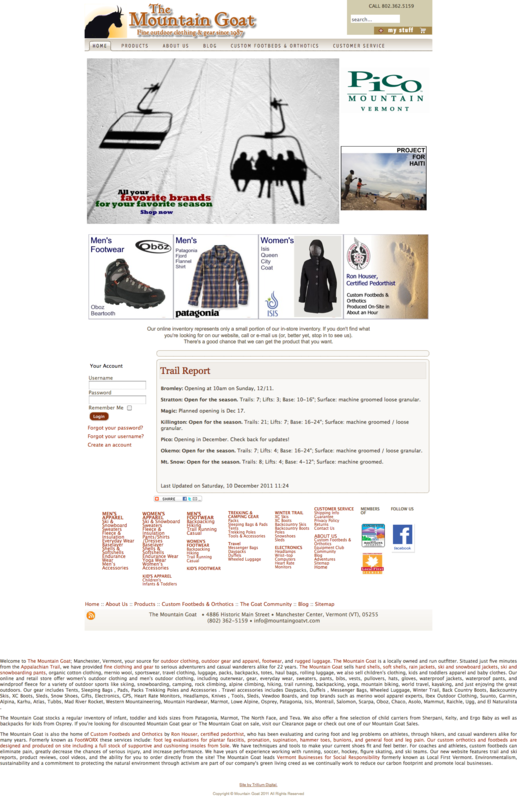 In addition to all the great gear you expect from manufacturers like Patagonia, Ibex, and Marmot, they also include information about custom orthothics created by Ron Houser, ABC Board Certified Pedorthist, as well as trail and ski conditions.